As the mother of a toddler, I am always excited when I find a nutritious food that my son likes to eat. The first time I saw a plate of meatballs disappear without a struggle, I was overcome with joy. And when I heard, “More meatballs, Mama,” I knew meatballs would become a weekly meal in our house. 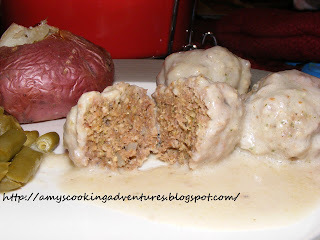 This recipe is a combination of the meatballs my mom made when I was growing up and the meatballs from The Sneaky Chef. These little meatballs pack a healthy punch with whole wheat bread crumbs, wheat germ, and green vegetables, all of which my son has yet to detect. Even my husband agrees that the taste and even the color didn’t change with the healthy additives. Yum! Mix together beef, breadcrumbs, wheat germ, puree, egg, onion, and salt and pepper to taste, until uniformly mixed. Roll into approximately 12 meatballs and place into a casserole dish. Whish together mushroom soup (undiluted) and milk. Pour over meatballs.